C.S.’s son Yuen Yee-man (源懿民 1912-1997) joined Koon Chuen Kow after receiving secondary education in his native Heshan and took over as manager of the firm in the 1930s. During the Japanese occupation, the firm suffered losses of over HK$100,000 as their warehouse was looted, overseas receivables were not collectable and the factory was ordered to close by the authorities. Y.M. Yuen went back to Heshan and later went into the retail trade in Canton. 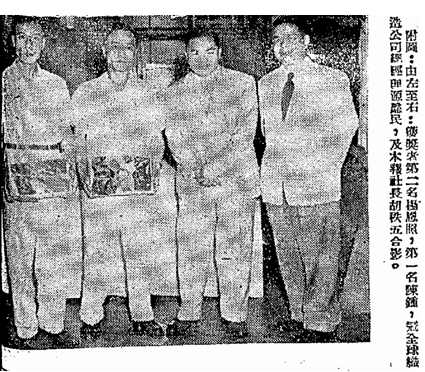 After the War, the Yuen family returned to HK to re-open Koon Chuen Kow and a branch factory was added in Canton. According to an early post war factory survey, the Koon Chuen Kow plant in Tai Kok Tsui employed around 500 workers with 16 electric machines, 70 manual machines and 60 sewing machines with daily production of 80 wool knitwear, 300 dozen cotton knitwear and 100 dozen artificial silk knitwear. All the raw materials were imported from abroad with the wool coming from Shanghai, Tientsin and the British Commonwealth, the cotton coming from Shanghai, Tsingtao, India and Japan and the artificial silk from Japan and the UK. By 1952 when the firm was first incorporated, the business had moved to a 3-story concrete building at 318-320 Un Chau Street in Cheung Sha Wan and was producing 200 dozen singlets and wool sweaters and 150 dozen swimsuits per day with 400 workers at peak months (200 workers off season). By 1954, business was booming with sales doubled that of previous year and the workforce expanded to 1000 workers with more machines (sewing machines doubled to 120 and a new equipment from the UK installed that could produce 20 different styles of cardigan). The firm also expanded into the manufacturing of wool and nylon gloves with one of the first glove machines in the HK. Roughly half of the business was domestic and the other half were exports to Southeast Asia, Africa and other parts of the world. Outside of work, Yee-man had served as chairman of the HK Hok Shan Association and active in philanthropy involving his home town. His sons Ronald C. Yuen (源植豐) and Stephen C.M. Yuen (源植綿) are both graduates of Pui Ching Middle School (class of 1952 and 1964 respectively) and both joined the family business. In the 1980s, Yee-man retired and passed the management of the firm to the next generation. Today, the firm and its affiliate KCK International Ltd remains involved in the knitwear business of cardigans, sweaters and pullovers exporting to major overseas markets but its staff in HK is listed as under 5. The business is currently led by Stephen Yuen who is a director of the HK Woolen & Synthetic Knitting Manufacturers Association. His wife Rosita Lam (林潔和, 1946-2016) served as executive director of her family business Golden Resources (best known for its top selling Golden Elephant brand of rice) from 1992 until her death in 2016. This article was first posted on 19th January 2018.